This is just a fraction of the haul. 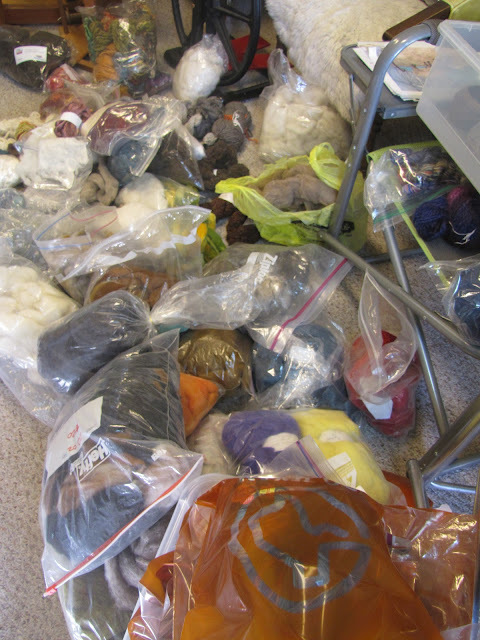 I forced myself to start sorting my fiber stash today. Oh. My. I'm a worse hoarder than I feared, even in my dreams. But my dysfunction is your windfall. I'm bagging and pricing a metric ton of really cool fiber that needs to find new homes via Saturday's huge Barn Sale. If you want to score some bargains, drop by between 10 AM and 3 PM and pick out some treats for yourself or a friend. Seriously. Save me from myself. If only you were in driving distance from NJ, Cindy! Feels good to purge...share the love...then probably go and buy some more! Am I right?!!! LOL! This is why I don't pull all my fiber together in one place!